With a less increase of the frontage over that to which Fig. I is limited it is quite possible to produce a better plan; and a further modification is shown in Fig. 3, which is devised for a 22-feet frontage, almost entirely doing away with the back addition. The front hall in this case is made wide enough to contain the staircase, and it is not continued through. The dining-room is put in front and drawing-room at the back, the latter being of L shape, with the fireplace at the re-entering angle. This would be an awkward room to place a dining-table in, but quite convenient for purposes of recreation, there being a nicely warmed cosy recess behind the door, where possibly the piano might stand. The dining-room has its door at one corner and the fireplace in another, sheltered from the draught, and arranged so as not to be against the back of any person seated at the dining-table. In the kitchen, left-hand light is obtained to the range, while a good open space is provided for the table, and the scullery opens out of it with a small larder beyond. The coal cellar and possibly an additional larder can be provided in the basement. 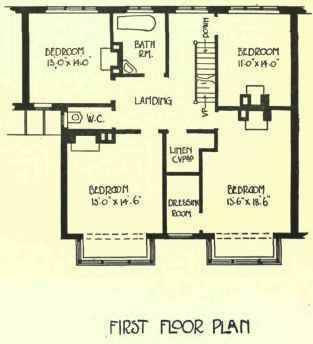 On the first floor there are three bedrooms and a bathroom, all fairly well lit, the front room extending right across the frontage, except for a small cupboard with a window to it if desired. If additional bedrooms were required the stairs would have to be carried up another flight, and in either case they would have to be lit from the top. Another modification of the same plan is shown in Fig. 4, the staircase not now being placed lengthways in the hall, but rising between the front dining-room and the kitchen. 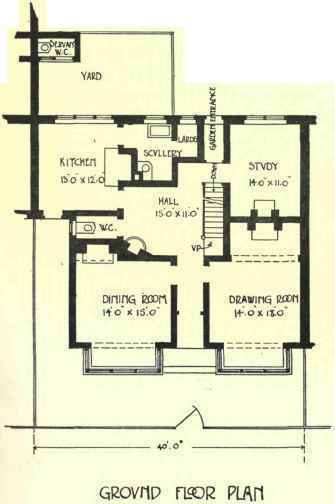 If this plan is adopted it is possible to arrange for a side entrance to the kitchen, in the manner which is shown. If the site be narrow, some difficulty arises in lighting the kitchen. As shown there is just room for a window, but this would not be the case if the site were narrower. The passage leading to the drawing-room is also dark, though a little light would filter through from the landing window, which is not very high up. A larder is obtained under the stairs from a back lobby, which itself would only have borrowed light through a back door, or by glazing the doors leading to kitchen and scullery. 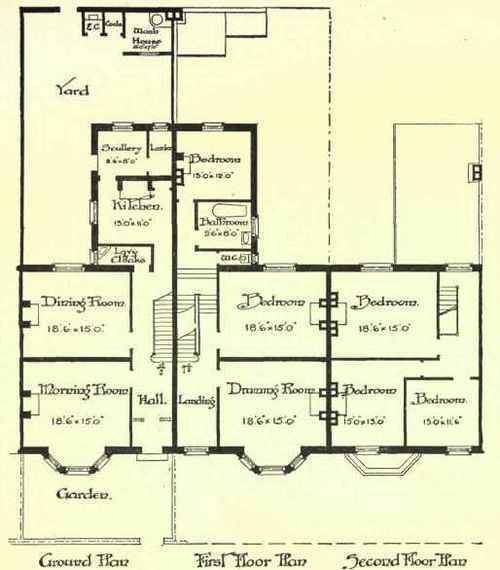 The bathroom and w.c. are obtained off the half-landing, and are yet out of the way and disconnected from the rest of the house; but on the first floor there is again an ill-lit passage, unless the house be only two storeys in height when top lighting can be obtained. It is of course quite possible to add another floor, but this would darken the passages on the floors below. 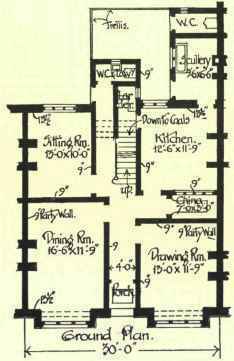 This plan, which is by no means an uncommon one, can be largely improved by widening the hall so as to obtain a fireplace in it, and allowing for a well to the staircase and a much larger landing window. If this be done, half the present objections to the plan disappear, and a comfortable house results, especially if the dining-room fireplace is put in the corner and the draught from the door screened from it by a small projecting piece of wall. 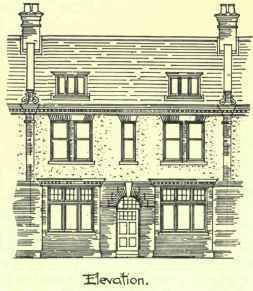 All the plans that have yet been illustrated in this chapter are what are known as "single-fronted" houses, i.e. they have a single sitting-room on one or the other side of the entrance; but another and now more common type is the double-fronted house illustrated in Fig. 5, having the two principal sitting-rooms to right and left of the entrance passage. The staircase generally rises centrally, either in the front passage, or at the back as it is here shown, and the third small sitting-room and a kitchen are obtained at the back, the former looking into a garden and the latter into a yard. A back entrance is contrived to the garden with w.c. beyond, and everything is arranged for back drainage. A small china closet is obtained between the drawing-room and the kitchen, and there is a larder at the top of the cellar stairs, separately lighted. 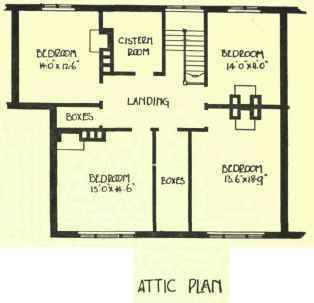 On the first floor there are three bedrooms, bathroom, and linen-store, while on the floor above are three attic bedrooms, and a boxroom. As the staircase occurs at the back of the house, it is well lighted from top to bottom, and the house is well ventilated without draughts. 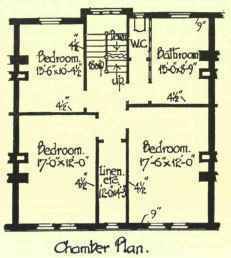 A comparatively narrow frontage of 30 feet has been chosen for the purpose of illustration, to show the sort of house that is usually built under such circumstances. 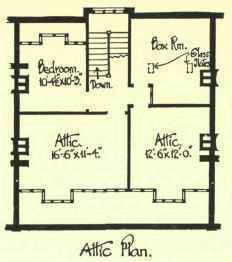 It is not considered ideal in many respects, but it is roomy and cheap to build, and under a single span roof except for small back additions on the ground floor. 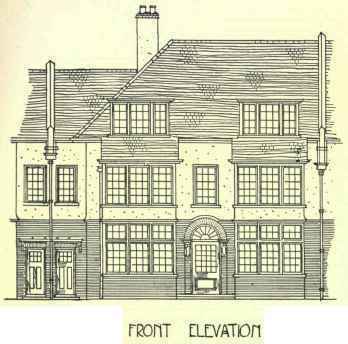 With a more extended frontage it is possible to do much better with this same type of plan, as is shown in Fig. 6. 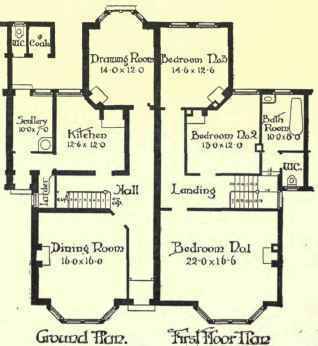 In this case there is a much larger and nearly square hall with a fireplace in it, the staircase rising centrally in the house, and the scullery being obtained under the main roof. A side entrance is contrived, so that there is no necessity for coals or dust to be carried through the middle of the house, having to traverse the kitchen only. It has been possible to give more consideration to the comfortable placing of the fireplaces, which in all the rooms are now cosily situated. The number of rooms is the same as in the previous case, but they are larger and more convenient. Probably such a house would cost little more than that last illustrated, but it would certainly fetch a higher rent, and be more comfortable to live in. It will, of course, be noticed that aspect and prospect, as already said, have little to do with the planning of these houses. Bay windows give an opportunity for looking up and down the street as well as just in front, and a back room may look out on to a garden. 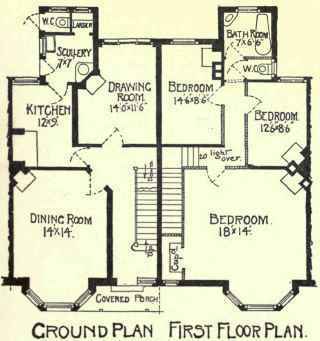 Nothing more can be done, and houses have to be planned just the same for one side of the road as for the other, as it would be unsatisfactory to place a kitchen in the front or a principal sitting-room at the back.